﻿ Amazing Cabin Hostel, Bali | FROM $5 - SAVE ON AGODA! "The dorm rooms are nicely planned, digital key to door and d..."
Have a question for Amazing Cabin Hostel? "Nice location for staying short." "Great place to stay in Kuta!" "Very comfy beds, well equipped for travellers." The Amazing Cabin Hostel is a great choice for the ultimate holiday. This Bali hostel is close to Manalagi Sango, Beer&Co., Beachwalk Shopping Center Kuta, Universo Legian, and Beachwalk Shopping Center. Offering guided tours, it is a great spot to stay to learn about your surroundings and see everything you can while you're here. It offers a range of facilities for guests to make use of throughout their stay, such as an outdoor swimming pool and a garden. The Amazing Cabin Hostel features air conditioning, so you'll have everything you need for a comfortable stay. 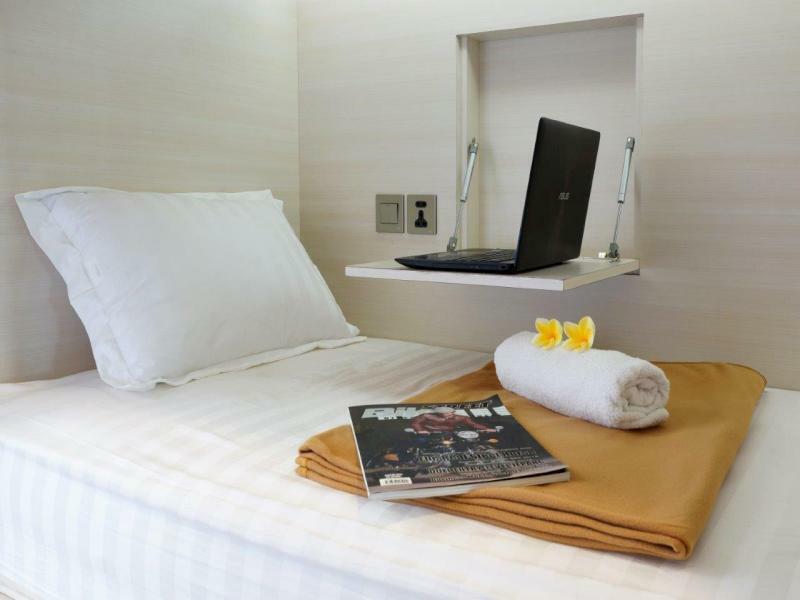 From daily housekeeping to laundry services, the Amazing Cabin Hostel provides useful services for guests to utilize. There's free Wi-Fi in all rooms, as well as Wi-Fi in common areas, so visitors can contact their friends and family back home without splashing out on international charges. The Amazing Cabin Hostel features a front desk that's open around the clock, so there is always someone on call to answer any questions that you have. This hostel offers check-in from 02:00 PM and check-out from 12:00 PM. With public transportation close to the property, you can get around easily. The nearest airports are Ngurah Rai International Airport (DPS) and Lombok International Airport (LOP), which are located 3.7 km and 120 km away. The Amazing Cabin Hostel provides a private check in and check out service, allowing guests the comfort of not having to visit the front desk. "It's ok and service good." this place was empty the 2 days I was there, didn't see anyone else the hole time which mean the dorm room was basically a private room however I came to bali to meet other travellers and that was just not the case at all here. the pool is disgusting there is no way anyone can swim in it it's that dirty. no breakfast included when there alot of cheaper hostels that include it. the positives the rooms were very clean, good wifi and beds were comfortable. location is great. over all if you aren't looking to meet other people or swim in the pool this place is fine but if you are go somewhere else. I feel like this hostel its like my second home, the staff were so friendly, i often borrowed few stuff they gave to me for free. Nice location, close to anywhere, easy access for anything, away from traffic, the room have an amazing bed, I slept well, nice cool econ. So far all good no complaints, couldn't find any better than this. Thx for everything! The dorm rooms are nicely planned, digital key to door and dorm locker, bed curtain for privacy, good air con, great location & quiet. However....upon arrival & check in, we noticed our dorm bed bedding was covered with loose hair and stained. Ugh!!! We reported this and they changed the bedding. All was very good after this. It does make keenly vigilante when you check in to ALWAYS check your bedding when taken to your bed. This place wasn’t very busy which makes me think it was an oversight, but good management should include a quality control of such important matter like clean sheets & pillow case. This place could be exceptional if the pool didn’t look green & the reception area furniture was relaxed. The couch was dirty and just gross. It had great potential if someone there cared more. That said, we did sleep well on comfortable beds. The location of this hostel is great, near to the shopping street and most importantly the beach. You will be able to access to restaurant, pubs, cafes, massage places and etc. 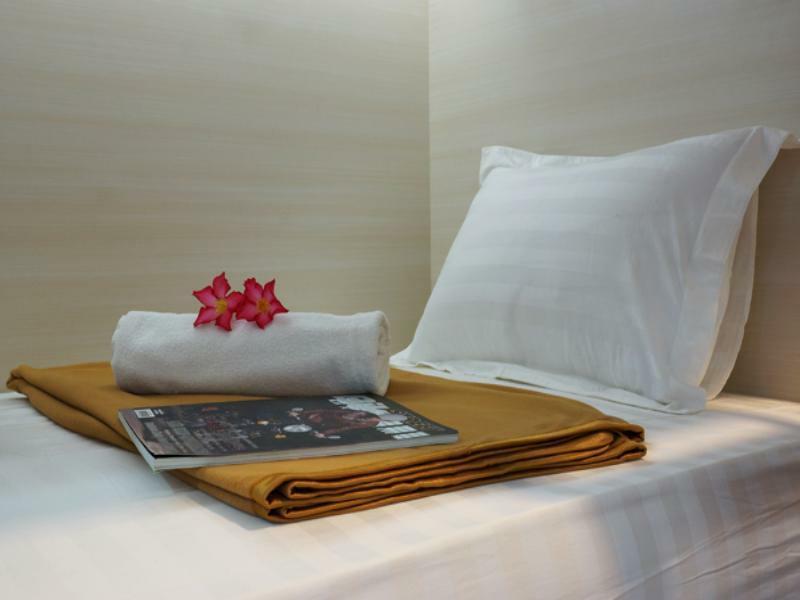 In overall, you get what you pay, great service, cozy feel of the hostel but the cleanliness can be improved. The name it's not same like in Agoda.. Just Amazing Hotel.. It's hard to find the hostel, even the taxi driver doesn't not.. Fortunately, by using my offline google maps we were able to find the hostel.. The hostel was great.. I love the facilities especially the safety box for the luggage.. But and safety.. Each person in the dorm have their own key to excess the room.. The room was clean by the stuff everyday.. I just hope they have the hairdryer in the toilet.. The location, near the beach.. Just 10 min walk.. IMPORTANT: Hostel has lockers under the beds which you access via a personal electronic key card. I walked in on a staff member who had another guests private locker open and was touching her stuff. He startled when he saw me come in, quickly pushed her stuff back in, closed the locker door and ran back to the bathroom he was supposed to be cleaning. Staff certainly shouldn't be using their key cars to access private lockers. This is appauling. I would not recommend staying here unless you also use a padlock to secure your items, even when in the supposedly secure lockers. I have downrated other aspects of this review as in my opinion it doesn't matter how good a location the hostel is in if the staff are accessing your private locker when no-one is in the room. So comfortable with this price. Pros: good air-conditioning (almost too cold sometimes! ), mattresses are decent. Privacy screens are a great idea. Light and universal power-point at each bed (in the dorms). Cons: shower is super dodgy (but gives hot and cold water). Used to be a monsoon shower, but all rusted over now. No locks on the doors for either shower or toilet (women's dorm). Bathroom is REALLY hot. As in, you could have a free sauna in the bathroom. I started sweating as soon as I finished my shower. BYO Towel. Pool looks kinda grimy, but I saw staff clean it, so it should be ok. Location is AMAZING, staff are nice. They let me keep my luggage there after check-out. Very hands-off for the most part. No real social atmosphere. I'd stay here again if I just needed somewhere to crash and wanted a super budget stay. If you actually want to spend time at your accommodation (during the day), maybe go for something with a nicer pool and bar. Great place to stay in Kuta! 1 minute walk and your in the street filled with markets and restaurant! 2minute walk to the main strip with all the clubs and partying! Hostel very clean with air condition and great wifi! Staying again when we come back to Kuta! When I was showed to my bed at Amazing Cabins I was sold. As you can see in the pics each bed has a light, electrical outlets and desk. You even have a shade for privacy. My problem lies in the super dirty shower that clogged and flooded it. There were also people arriving all through the night up until 3:30am and the desk host kept turning on the bright overheads when they would come in! So much for a privacy shade. All this said, it was great value for the money and the staff was really nice. Really good budget hostel. Reception and staff is very friendly, air con is fantastic. The place was always kept really clean. The only negative I can say about it is it's not an overly social hostel and the wifi isn't very fast. But other than that it's been a fantastic place to stay in Kuta. Third time in Bali, I have experienced many kinds of accomodations in Kuta/Legian and found Amazing (cabin) hostel/hotel is the best one for its price, location, etc. Actually I was planning to stay here for 1 week but couldn't help making it much longer than expected. You should search Azaming hostel kuta in goggle maps .i detach Azaming cabin hostel .is very difficult to find .and I send email i hope someone maybe can go out side pick up me .because I’m still around Azaming cabin hostel 1hour alerady .but staff say no .then I ask someone In street .and them tell me maybe is Azaming kuta hosetel .you can go there ask .finially .i find that hotel .name :Azaming hostel kuta .spent my 1hour more . Nice staff, good location and generally clean facilities, however they don't change the sheets between guests. They just brush the sheets down. overall good. bed is comfy and very quite place. just wifi is not really working in room.